On May 4th I posted a pattern for a Death Star pillow and after a reader brought up an issue with the trench stitches, I decided to double check the pattern. I made a very VERY small version and discovered that this reader was right (thank you!!). I adjusted the pattern but then went back and tried the original pattern’s instructions for the trench. The difference is that in version one, the trench is made up of slip stitches and in the second version (the one I posted) the stitches are single crochet in back loops only. For this mini Death Star I went with the first version. 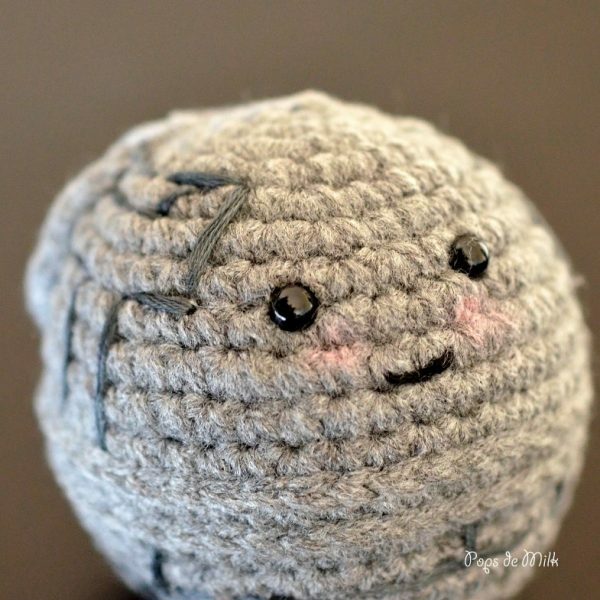 Normally, once I test a pattern I unravel and reuse the yarn for something else but….the tiny Death Star looked so cute I decided to add details and finish it. I was in the middle of stuffing the sphere when I got an incredibly random thought: Usually when you look at images of the Death Star you see the superlaser but…what about on the other side? And yes, the space station is blushing because that is what space stations do. Or maybe I was experimenting with blush on a crochet project. I found this great tutorial on Crafty is Cool for making face detail and one of the tips is how to use blush. What do you think? Little Death Star is so shy! Download the PDF pattern here or find the pattern below. Notes: Unless otherwise stated, this pattern is worked in continuous rounds using stitch markers to locate the beginning/end of a round. Work in somewhat tight stitches. 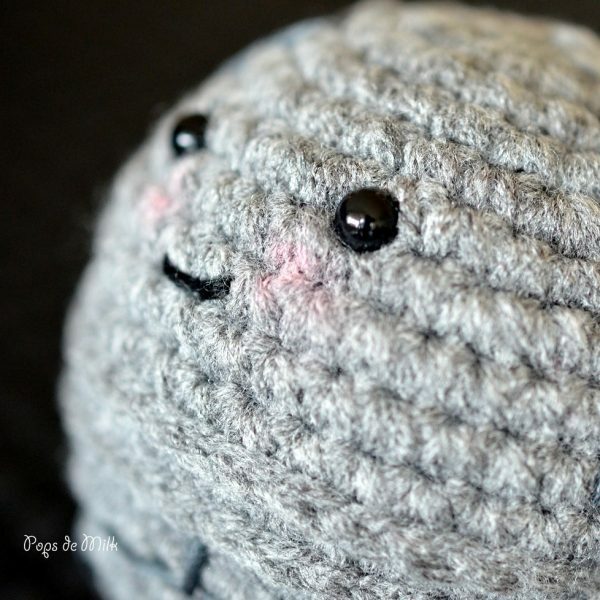 Using 3.50mm hook and True Grey yarn. Attach safety eyes and embroider smile. Begin to stuff with fiberfill. Round 23: dec 4 times. Fasten off and sew opening shut. 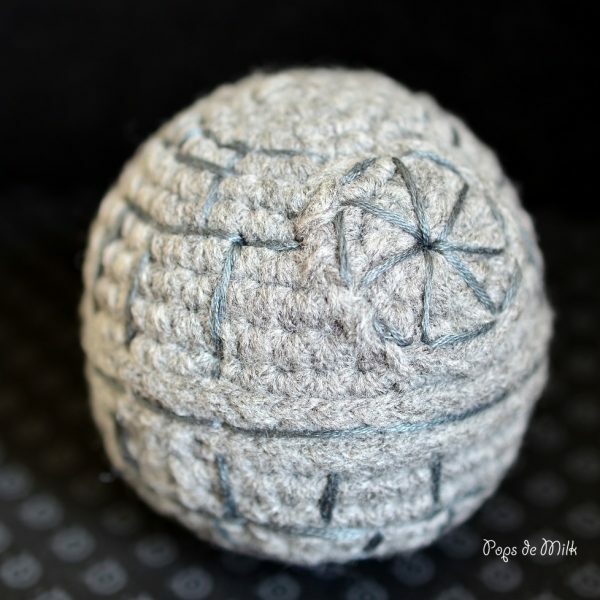 With embroidery needle and grey embroidery thread, stitch vertical and horizontal lines around sphere and on superlaser – to help me with some of the line stitch placement I Googled photos of the Death Star and used them as guides. I left the face area free of lines but you can add them if you like. Optional: apply a dab of pink blush to face, as pictured. 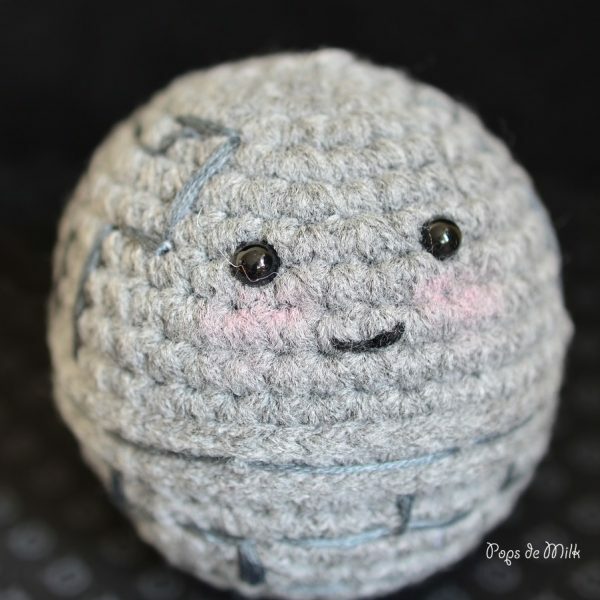 I’m putting the finishing touches on the full-size Death Star but I’ve Got to make this tiny, cute version too. Oh WOW! That’s the cutest little not-moon! 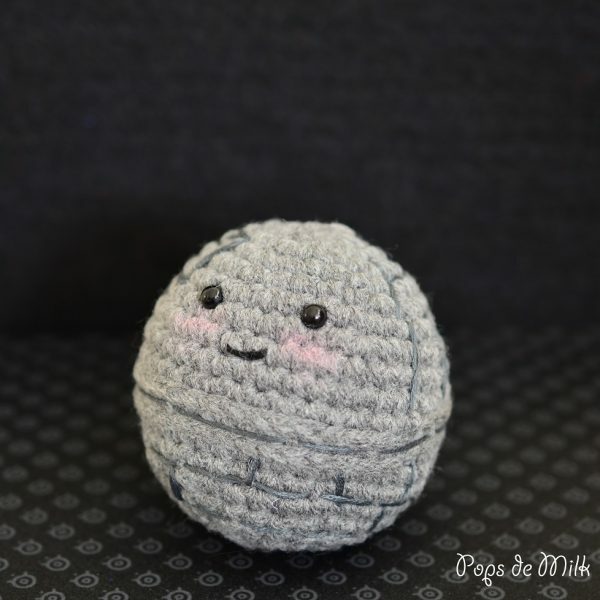 Since I made your big one recently for my bf’s birthday, I have GOT to make the little one too. Thank you!! !